Gartner announced its predictions on Monday, in which it said it believes Apple's iOS will control 68.7 percent of tablet sales in 2011. That would be down from the firm's estimate of 83.9 percent share in 2010, but still gives Apple a commanding lead over its competitors. Next year, Gartner sees Apple's iPad representing 63.5 percent of tablet sales, while the entirety of the Google Android platform, bolstered by its appearance on multiple devices, is expected to grow to 24.4 percent. And in 2015, Gartner sees Apple's share of sales dipping below 50 percent to 47.1 percent, while tablets running Google Android are projected to grow to 38.6 percent of devices. Gartner said that the iPad has done to the tablet market what the iPhone did to the smartphone market: re-invent it. With the iPad, Apple has a rich ecosystem of content that will serve as a strong pull for consumers in the years to come. "Seeing the response from both consumers and enterprises to the iPad, many vendors are trying to compete by first delivering on hardware and then trying to leverage the platform ecosystem," said Carolina Milanesi, research vice president at Gartner. "Many, however, are making the same mistake that was made in the first response wave to the iPhone, as they are prioritizing hardware features over applications, services and overall user experience. "Tablets will be much more dependent on the latter than smartphones have been, and the sooner vendors realize that the better chance they have to compete head-to-head with Apple." Gartner sees Google's decision to not leave Android 3.0 Honeycomb truly open source will prevent fragmentation of the platform, but it will also slow the price decline and ultimately cap market share. "Volume will be driven by support from many players, the ecosystem of applications for tablets getting more competitive and some platform flexibility allowing lower price points, said Roberta Cozza, principal analyst at Gartner. "The new licensing model Google has introduced with Honeycomb enables Google to drive more control, allowing only optimal tablet implementations that dont compromise quality of experience. This might mean that prices will drop at a slower pace than what we have seen in the smartphone market." Gartner defines a "media tablet" as a device with a touchscreen display used primarily for consuming media. Devices must have a screen size greater than 5 inches, and can be up to roughly 15 inches in size. Media tablets also run a lightweight operating system, as opposed to a full-featured OS like Windows. The firm sees Research in Motion's QNX platform making a splash once it is available on the company's phones, in addition to the PlayBook tablet, starting in 2012. Having QNX on all of its devices will allow RIM to offer a consistent experience across its whole product portfolio and create a single developer community. And Gartner analysts see other platforms like MeeGo and WebOS having limited appeal unless they can also grow in the smartphone business. 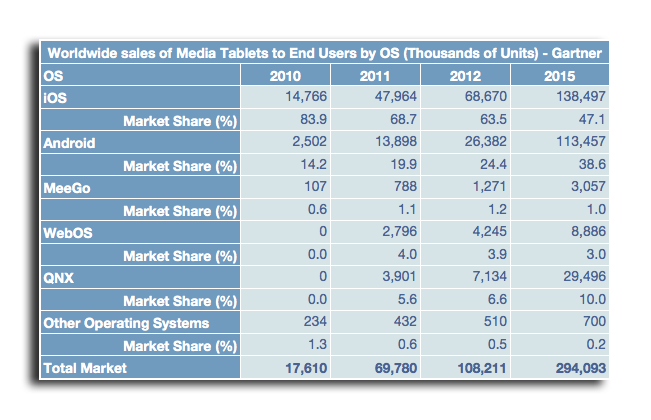 Currently, MeeGo and WebOS do not have a major presence in the smartphone market. "Smartphone users will want to buy a tablet that runs the same operating system as their smartphone. This is so that they can share applications across devices as well as for the sense of familiarity the user interfaces will bring," Milanesi said. "Vendors developing on Android should be prepared to see more cross brand ownership as some users might put OS over brand when it comes to the purchasing decision. Improvements on usability and brand recognition are the strongest differentiators they can focus on." Gartner's tablet market share predictions come just days after the firm issued its projections for smartphone mobile operating system share, also through 2015. It predicted that Google Android would be on 49 percent of smartphones sold by 2012, but also prompted questions about the firm's "radically revised" forecast since 2009. In March, Gartner lowered its forecast for PC sales in 2011 and 2012, citing the iPad as a device that will weaken demand for traditional computers. The firm believes that "media tablets" like the iPad are "redefining" the PC's place in consumers' lives.